The big question since Assassin’s Creed Odyssey was first revealed has been ‘Are the monsters real?’. The first trailer showed a glimpse of what appeared to be the Minotaur from the legend of Theseus, but the way myths were threaded into Assassin’s Creed Origins suggested that such creatures could be mere hallucinations, or even just a man wearing a bull’s head. But at Gamescom 2018, Ubisoft has revealed that the monsters are real. Well, sort of. Talking with IGN on its Gamescom 2018 livestream, creative director Scott Phillips explained that the monsters in Assassin’s Creed Odyssey are, in fact, humans who have been corrupted by artefacts left behind by the First Civilisation. These artefacts – which sound like even more ancient versions of plot MacGuffins like the Apple of Eden – transform regular humans into monstrous creatures. 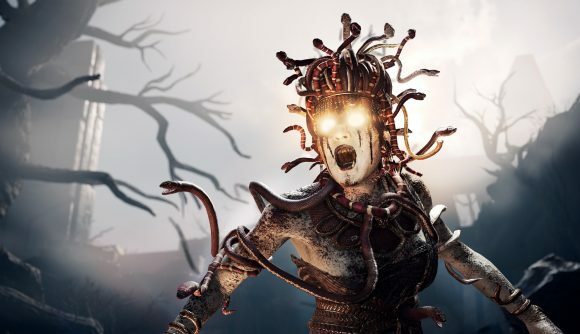 In the demo shown at Gamescom, Kassandra must defeat a character who has been turned into Medusa. In discussion with IGN, and in our own Gamescom Assassin’s Creed Odyssey interview, Phillips emphasises that the more mythological elements of the game are present in side-quests and endgame content, allowing the main story to be more grounded. For example, the Medusa questline is ranked at level 50, meaning you’ll have to progress beyond the finale of the game to be tough enough to defeat her. But how can a Spartan go toe-to-toe with a creature that can turn people into stone? Well, luckily, Odyssey’s central characters have ancestors based in the First Civilisation, which means they can shrug off some the more powerful abilities. Medusa can certainly deal a huge amount of damage, but her gaze won’t turn you to stone, for instance. That ancestry may well be part of the Animus storyline, and may be what ties it into the grander story of the franchise. The Assassin’s Creed Odyssey release date is October 5. That means we’re just a few weeks away from being able to explore this fantastical new spin on Ubisoft’s historical romp.